Kapaa Sands sits on what were once the grounds for a Shinto Temple. Traditionally, Shinto shrines and temples were built near unusual concentrations of nature. With all of the incredible ocean views and lush foliage on our grounds, one quickly understands how this property was the perfect spot for such a hallowed structure. In medieval times, Shinto architecture often incorporated a sacred arch known as a torii. This is the symbol we use in Kapaa Sands’ logo to this day. In addition, many of the original condominium units still have shoji screens inside — another influence of the original Shinto temple. When you visit our office to check into your Kauai condo rental, ask about the large stone located nearby. 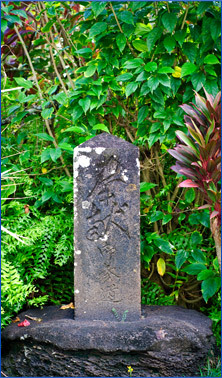 Dated approximately 1923, Japanese elders have interpreted it and say it indicates the “marker to the entrance of a pathway.” The owners and staff of Kapaa Sands welcome you to the pathway to a relaxing vacation on Kauai.